WASHINGTON, DC – Today, The House, Inc. Student Leadership Center announced that First Lady of The United States of America, Michelle Obama, will serve as Honorary Chair of its 2015 National Capital A Cinderella Ball in Washington, DC. Mrs. Obama is a role model to so many young people, and because of her leadership, more teens will make a strong dedication to serving the causes of their peers, changing the lives of children who are mistreated because they are different. To be held on May 31, 2015 at The Willard, Washington, DC, the tenth anniversary Ball honors children living with a disability or life-threatening illness from military families who are many times sidelined from societal events. The annual gala includes the private dinner, entertainment, award presentation highlighting inspirational moments of these courageous children, and the after-party Ball. The Ball is a quality-of-life public service initiative given by pre-teen and teen members of The House, Inc. Student Leadership Center. This act of kindness is appreciated and further enabled by collaboration with community members, business partners, and foundations. The National Capital A Cinderella Ball has improved the lives of thousands of children and their families. The Ball will highlight The House, Inc.’s decade of passion and dedication to improve high-school graduation rates, college access, and equality of opportunity in the communities it serves through its innovative youth development programs. “I am honored to acknowledge the commitment of the First Lady to the National Capital A Cinderella Ball,” said Helen McCormick, President and Founder of The House, Inc. "Having such prominent support as the First Lady is a testament to the powerful mission and message of The House, Inc.’s youth advocacy and public service initiatives." A nationally recognized youth development program and developer of the National Capital A Cinderella Ball, The House, Inc. Student Leadership Center is an originator and provider of out-of-school time programs for pre-teens and teens in Greater Washington, DC. Now in its tenth year, The House, Inc. program initiatives work to improve health, education, and employment outcomes for middle and high school students. Helping students achieve college access is its 1K Destination: Graduation college readiness and scholarship initiative. The 2013-2014 Catalogue for Philanthropy: Greater Washington recognized The House, Inc. as "One of the Best" nonprofits of the year. The House, Inc. Student Leadership Center is a 501(c)(3) not-for-profit organization. Learn more about the 2015 National Capital A Cinderella Ball by exploring here. In 2014, Mrs. Obama launched the Reach HigherInitiative, an effort to inspire young people across America to take charge of their future by completing their education past high school, whether at a professional training program, a community college, or a four-year college or university. Reach Higher aims to ensure that all students understand what they need to complete their education by working to expose students to college and career opportunities; helping them understand financial aid eligibility; encouraging academic planning and summer learning opportunities; and supporting high school counselors who do essential work to help students get into college. As First Lady, Mrs. Obama looks forward to continuing her work on the issues close to her heart — supporting military families, helping children lead healthier lives, and encouraging all our young people to fulfill their boundless promise. Michelle and Barack Obama have two daughters: Malia, 16, and Sasha, 13. Like their mother, the girls were born on the South Side of Chicago. 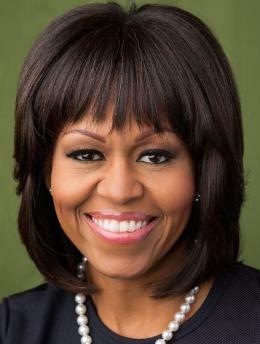 Follow First Lady Michelle Obama on Twitter @FLOTUS.